Full Review: Back in 2008, a little-known black belt under Roy Harris released a DVD detailing the techniques he felt were important for white belts to learn on their journey to blue. The quality of Roy Dean's production stood out, as did his eloquent instruction. I continue to point to that release as the gold standard for beginner DVDs. In the years since, Dean has added to the Requirements series, but he never produced a Blue Belt Requirements 2.0 (though many would be interested in such a DVD, myself included). There was a marked shift from Blue Belt Requirements to Purple Belt Requirements, where the pattern went from in-depth explanations of technique based around some major areas to much swifter demonstrations in a smaller selection of positions. The streamlining of instruction and shift of focus continued into Brown Belt Requirements, a process which has now reached what is presumably its conclusion: Black Belt Requirements. Dean's marketing blurb for the DVD answers the question most people will immediately ask after seeing that title: "You don’t have to be a black belt to know what it takes to get there." The audience would be rather small if only brown and black belts bought this DVD. The 'requirement' that guides the content of Black Belt Requirements is summarised in the release email Dean sent out shortly before his DVD hit the shelves: "this project is about sharing the art, and the lessons are for everyone. The true black belt requirement is the ability to teach, which keeps the art alive." At present, there are still numerous BJJ instructors who are not yet black belts (I'm one example, as I run a class but I'm only a purple belt). This situation is likely to change once BJJ reaches saturation, but that won't happen for at least a few more years, perhaps decades. It may even continue indefinitely, given that belts in jiu jitsu take a long time to achieve, meaning that some lower belts already feel they possess sufficient knowledge to provide worthwhile instruction to students. Based on that release email, I was expecting a lesson plan, perhaps with some advice about how to teach, example warm-ups, maybe some discussion of methodology. Instead, the DVD is much like its two predecessors in the series: if you don't already know how to teach, then this DVD is not going to provide you with that ability. That's not to say it won't offer up some possibilities, but with the exception of the opening 'welcome', that theme is more of a subtext than a driving force. Since Purple Belt Requirements, there has been a division between the technical meat of the set, belt demonstrations then some kind of seminar. Purple Belt Requirements did that over two discs, while Brown Belt Requirements spread it across three (and unusually, the 'seminar' was a very interesting dissection by Roy Harris of a failed brown belt test). Black Belt Requirements follows suit, with the first disc full of instruction, the second running through a couple of belt demonstrations and rolling analysis, before finishing with a seminar on the final disc. Disc One starts off with Dean's trademark Welcome (03:28 mins), where he states that "A true black belt can keep the art alive by sharing it. Teaching is a skill, and now I'd like to show you one method, one way." This is packed with lots of sensible advice, along with Dean's typical philosophical musing. I especially liked that the discussion was conducted entirely via voiceover. While listening to Dean's thoughts on teaching, you get to watch some smooth jiu jitsu, as opposed to a talking head. The instruction is heavily focused on offence and submissions. There is almost nothing in the way of escapes, transitions or maintaining position. Although that has all been covered in previous DVDs, I still would have found it interesting to see a black belt perspective on those topics, as they are generally less well-represented on the instructional market than attacks. Of course, submissions are important, seen by many as the essence of BJJ. Also, if you subscribe to the progression laid out in Saulo's Jiu Jitsu University, then this DVD makes perfect sense: Saulo also focuses on submissions in his 'black belt' chapter. Dean's format for this opening disc is nine sequences, where first a couple of techniques are shown in isolation, then variations and what ifs, until Dean can build up a flowing combination. That fits with another quote from the 'Welcome' section, where Dean describes his teaching methodology as "take a technique, then place techniques in relation to it. When each puzzle piece fits perfectly, it becomes a picture, an integrated whole." It's also familiar from the Roy Dean seminars I've attended, where he teaches a huge number of techniques. For this DVD, that 'integrated whole' is shared with the viewer at an even faster pace than the last DVD, stripping the instruction down to an efficient core. In other words, this acts as a quick refresher for a black belt considering what techniques they might want to teach in a particular lesson. Each technique is taught by Roy Dean in a black gi, while his demonstration partner wears a white gi. There is not a huge amount of detail, with Dean following his own advice from his introduction to not overteach. You will sometimes get more than one angle, but it depends on the technique. Dean will run through it again a few times at the end full speed, sometimes just once if it is sufficiently simple. Stand Up (07:13 mins) starts off with the entirety of the sequence at full speed, succeeded by a concise explanation of each component: the same pattern recurs in later chapters. The first stand-up technique is a grip break into kouchi gake (one minute), which is basically a trip straight into half guard. Just under another minute is spent on an inside grip break drill, before looking into the ankle prop for forty seconds and an ankle pick for another fifty seconds. Next up is another forty seconds on the inside trip, where again you're stepping into them and tripping. The inside trip dominates the rest of the segment, with several variations. Dean spends thirty seconds on how to move from an inside trip to a low elbow single, where he uses elbow pressure for the takedown. He then demonstrates an inside trip to hopping uchimata for forty seconds, which follows on smoothly from the previous technique, as does the inside trip to uchimata tai otoshi (thirty seconds). The section finishes with an inside trip to ankle pick, returning to that earlier piece of the puzzle for just over a minute. I was excited at the prospect of the tripod sweep (07:37 mins), as that is one of my favourite options from open guard. As it turns out, the content is geared towards what happens immediately after the sweep rather than the sweep itself. After the fifty-five second chapter summary, Dean covers the basic tripod sweep into knee slide in fifty seconds. 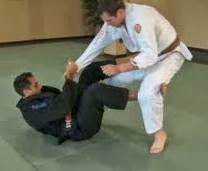 He then takes thirty seconds to offer an alternative, going from a tripod sweep into a leg drag pass, an increasingly popular method of passing the guard. Forty more seconds looks at the classic tripod to sickle sweep combination, moving directly into an armbar. Interestingly, that is followed by almost a minute on countering a tripod sweep, which is essentially cross-grip, step back and pass. There is some debate about whether it is better to show both sides of a technique, so that each person has something specific to work in sparring, or to teach one side at a time so you have a chance to work the mechanics against somebody who doesn't necessarily know the defence. Dean does not go into the counter to the counter, but that's understandable, as it would be a long road to step onto. Dean takes a bit more time over the tripod sweep to wrist wrap (which I know as the gift wrap), spending a little under two minutes. There are numerous submissions from that position, which Dean covers, before finishing up with a similar two minutes or so on options after you establish the gift wrap from closed guard. This does rather veer from the 'tripod sweep' topic, as he gets to the gift wrap from a flower sweep this time. Collar Chokes (07:53 mins) opens with slightly over a minute on the fundamental 'palm up palm up' choke. Dean shows it no frills, then two quick options: the super deep 'Relson choke' grip I've been using since Dean showed it on Brown Belt Requirements, along with straightening your arms if you're not deep enough, as that shoots your hands into place. Another minute and a bit shows how you can threaten the choke to set up a scissor sweep, before Dean demonstrates what he calls the 'fist choke'. This is unusual, though it has some similarities to the Relson choke. Like that choke, you're reaching to the other collar and pulling to cinch up the submission. This time, the pressure on the other artery come from driving your knuckles directly into the neck. Pulling on the collar and locking your legs in position gives you the leverage. That then progresses to fifty seconds on flowing from the fist choke into a wing sweep, where you're flipping them over with one leg (Marcelo calls this the 'cross arm and belt sweep'). The baseball bat choke has had a resurgence of interest recently, thanks to Magrid Hage's success with that technique. Over the course of a minute and a half, Dean shows the version which Hage has used to impressive effect, where it is secured as they pass your guard. When they duck their head, you establish your grip, then spin in the midst of their pass. You can also roll them over to finish from the top. A minute's worth of another baseball bat choke closes the section, this time from standing. After establishing grips, Dean uses it to throw his partner, then finishes on the ground. Along with tripod sweeps, I was also particularly looking forward to top side attacks (09:41mins). Of all the sequences, this was probably my favourite, but that is most likely because it is the closest fit to the techniques I've been working on recently (e.g., my last private with Dónal). Many of these will be familiar to you if you have watched earlier installments in the Requirements series. It's also worth noting that some of them rely on specific gi grips, so will not be applicable without the gi. Kesa Gatame to straight armbar opens the segment, where you step over the arm then use your bottom leg for leverage, followed after thirty seconds by the americana from kesa gatame. This is the same technique as Renzo's old DVD from 1994, which receives fifty seconds of attention. Sticking with the kesa gatame theme (although this is now kuzure kesa gatame, gripping the far armpit rather than under the head), Roy Dean moves on to one of my favourite techniques from side control, the step over triangle. When I use this, it is normally from standard side control, but scarf hold makes more sense. In that position you already have the arm controlled, something tougher to achieve from side control. This position warrants multiple angles, which Dean uses efficiently on this DVD. The additional perspectives only crop up when they are actually needed, rather than applied to every technique. A rapid thirty seconds covers what Dean refers to as the 'white belt kesa gatame armbar', consisting of a guard pass, switch to kesa, armbar attempt and finally an americana. This is contrasted with a little over twenty seconds for the black belt version, which looks much the same except that the joins are less obvious. Here, the pass is directly into kesa, anticipating the turn of the arm right into an americana. I watched this chapter first, so thought that this division between 'white belt' and 'black belt' versions of a technique would be a recurring theme, but aside from the exploration of the kimura on disc two, this is the only time it occurs. Sticking with kuzure kesa gatame, Dean steps over the head for a straight armbar, taking less than thirty seconds to teach it. If they push into your bicep, then as Dean demonstrates for the following forty seconds, their arm is already extended putting them right into an armbar. You can also use that motion of stepping over their head to put on a choke, which again takes about forty seconds of instruction, or use the gi tail grip for a more powerful version (another thirty seconds). If when you go for the choke and they push into your leg, this may mean that their outstretched arm enables you to grab their wrist and roll your hips back over, moving into an americana. Dean shows you how in thirty seconds, before progressing to the usual lockflow of americana to straight armbar into the kimura. This takes Dean over a minute, as he also includes a nifty option of stepping over their head when you apply the kimura if they try to roll you over. That means you can apply a kimura and a triangle simultaneously. The last technique (roughly a minute) adds on a switch to a far side armbar if you miss the kimura. The backstep (06:42 mins) merges passing and transitions with attacking, a smooth display epitomising Roy Dean's beautifully flowing jiu jitsu. From reverse knee on belly, Dean backsteps and rolls into a triangle (forty seconds), then shows the same motion into an armbar (forty seconds again). Next, Dean demonstrates how to pass the guard into a similar 'backstep armlock', which can also switch into a triangle (yet again, forty seconds). 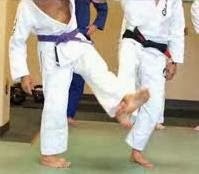 If they are blocking your hip when you try to pass, you can then use a grip around their leg to pull their thigh towards you, backstepping in the other direction (fifty seconds). The backstep also functions as a method of countering the scissor sweep straight into a guard pass, shown in thirty seconds. A similar option works for beating the butterfly guard, a motion Dónal has been drilling in his classes over the last month (just under a minute). Even if you're almost swept, Dean explains in thirty seconds how it is never too late to backstep. To finish, there is forty seconds of countering the de la Riva guard by backstepping, then sitting on your opponent. Staying below their knee, that sets you up for dropping back into a kneebar. Dean sticks with his submissions focus with the straight armlock (07:59 mins), building from thirty seconds on the very basic spinning armlock from mount. By that, Dean means the armbar from mount where your opponent foolishly pushes straight up into your chest, presenting you with an obvious armbar. That's then joined by a minute-long 'fast' version, off an americana. You can also step over for an armlock from knee on belly (thirty seconds), as well as switching sides with your spinning armlock (thirty seconds again). Thirty more seconds looks into recovering if they pull their arm free, before another thirty seconds examines jumping right from a figure four grip into an armbar, plus forty seconds on the same jump but with leg pressure. If you are having trouble finishing the armlock, Dean has a variation where you stick your leg through and triangle them when they roll (forty seconds). A more aggressive option is to smack their grip open by pushing on the elbow (thirty seconds), followed by thirty seconds on the 'Camarillo leg push'. Grab their leg, they roll slightly, then extend your legs to get the position you want. Finally, Dean spends forty seconds on another armlock switch, which can also be finished with a triangle. The americana (08:29 mins) confusingly repeats the instruction we've just seen, with fifty more seconds of the spinning armlock from mount. The reason Dean gives is that he feels this is a good place to start teaching the americana. That progresses into the standard americana from mount for forty seconds. After being armlocked with the previous technique, Dean's thinking is that they will keep their elbows in, leading into the americana. From a mounted americana, you can dismount to side control by backstepping when they straighten their arm (slightly over a minute). From there the same bent arm lockflow from earlier presents itself. Several repetitions from top side attacks feature next, with the step over choke (thirty seconds), step over choke to americana (forty seconds) and americana from kesagatame (fifty seconds). Although this fits into the next technique, I would have thought it more useful to choose a different selection. On the other hand, you could argue it makes sense from the perspective of creating a sequence of moves to teach. Dean gets back on track with fifty seconds of an americana reversal from bottom. Now you're the one being treated to an americana, but using a stiff arm escape, you can reverse them into an americana of your own (forty seconds), holding onto their wrist as you perform that stiff arm escape. Should they resist, you can roll back the other way for an americana from the bottom position, bridging to finish it from the top if that doesn't work either. The last option is a recounter, where Dean uses his final minute to explain how the person being reversed in the previous technique can switch into an armlock. An armdrag/2 on 1 (09:57 minutes) is a versatile technique. It can be done from standing to move into a rear naked choke, which Dean says he likes teaching to beginners (slightly over a minute). It can also be done from kneeling, again into a rear naked choke (forty seconds). From butterfly guard, Dean takes forty seconds to show how you can take the back, then another minute to go from butterfly into a rolling choke followed by thirty seconds for a rolling armlock. Butterfly guard armdrags can also yield a calf crush, but be careful with this one as it can cause serious damage. After a minute on that, there is thirty seconds on a hook sweep before around a minute covering some further pointers on taking the back with the armdrag from butterfl. Next up is what Dean calls the 'butterfly 2 on 1', a position from which he then demonstrates a triangle for thirty seconds. A wristlock flows into a rather flashy 'inside kimura' for another minute, where you're essentially getting a figure four grip and flipping them to the side. You can then finish with a kimura on the near arm rather than the usual far arm, keeping your head on their shoulder for control. The closing forty seconds cover the 'kimura roll', where from the same position you swivel underneath to then apply that same near side kimura. Dean's closing section for the first disc is probably his favourite submission (judging by previous DVDs and his long legs), the triangle choke: it's also the biggest chapter, clocking in at just over eleven and a half minutes. A minute on the simple wrist push set up kicks off proceedings, then forty seconds on a classic set-up from spider guard. What Dean calls the 'knee push triangle' is another standard entry, where you do a scissor sweep motion over their arm to lock in the triangle (thirty five seconds). He makes an interesting comparison to passing the guard here. As Dean explains, both involve going either over or under to enter the technique. With passing you're circumventing the legs, with a triangle you're getting past the arms. Next is a minute and a half described as 'balance break to arm extension'. By that, Dean means attempting a sit-up sweep, which makes them post their arm, in turn making them vulnerable to a triangle. Something similar can be done from the neck tie, as Dean explains for another minute, before a quick twenty seconds on how you can knock them to one side when they put their knee in your tailbone. Once again, you are baiting them to post their arm, to create a triangle opportunity. Should your triangle fail, there is always the armbar. To quote Dean: "the armlock is a necessary follow-up to the triangle: you have to know this, you have to share this." This is also from the hip bump, followed by another variation where you spin out for the armbar, taught in slightly over a minute. If they posture up, you can push up off your hands to knock them backwards, finishing your triangle from the top (forty seconds). The other classic combination with a triangle is an omoplata, shown by Dean over the next forty seconds, before a little under two minutes demonstrating the reverse triangle into various other armlock variations. That finishes both the triangle section and the first disc of this three disc set. The second disc begins with rolling analysis. It's relatively short at eighteen minutes, but that's long enough to cover plenty of different scenarios. Unlike earlier Requirements, there is only one roll here, between Roy Dean and a student he has taken from white to brown belt, Donald Bowerman. Slow-motion features when Dean wants to emphasise a particular technique or transition, narrated in a conversational style. For example, Dean will make comments like "he's really been holding on to grips recently." I think this would be more engaging if there was less of a skill gap: for example, two of Dean's brown belt or purple belt students rolling together. Having said that, Bowerman does occasionally get into a dominant position, which generates more interesting commentary. Something else which I feel would improve the value of this section is if the other person involved in the roll was also present on the commentary. However, I can imagine this could be difficult to set up, as it would need to be not long after the roll for maximum relevancy and would also depend on the other person's public speaking skills. In keeping with the other DVDs created by Roy Dean, the belt demonstrations included are available on YouTube as well: the DVD provides a boost in audio and video quality. The two included on Black Belt Requirements are Thompson Brown (17:46 minutes) and Higinbotham Purple (18:04 minutes). Byron Higinbotham looks especially impressive in his demonstration, perhaps due to an extensive background in martial arts prior to Brazilian jiu jitsu: he runs an RDA affiliate in Southern Oregon. If like me you've watched all of the prior DVDs from Roy Dean, you might be wondering why Jimmy DaSilva is not on here doing a black belt demonstration, given that his brown belt demo was on YouTube back in 2009. Judging by Google, it would appear he remains a brown belt but no longer trains at RDA, having set up on his own. Gracie Worlds 2013 (04:33 minutes) is footage from a submission only tournament, vigorously promoted by Rose Gracie. Unlike true submission only, the Gracie Worlds has a time limit, but nevertheless you can't win without a submission (if nobody gets a submission within the time limit, you're both out). These videos would have been greatly improved by commentary, perhaps with the person in question talking about their experience at the tournament, what they like to do, how it relates to competition and so forth. Still, competition footage is a valuable addition to any instructional, especially if it includes techniques taught elsewhere on the DVD. Byron Higinbotham opens this section, listed as the champion even before things get started, which changes your view of the fights. It rather looked like he was fighting a brown belt, but that could have just been a strange shade of purple. The video quality is not up to the same standard of production as the rest of the DVD, but that is understandable: presumably it is off a lower grade camera given it was filmed at a tournament. I was not certain which was Higinbotham, as neither of the competitors were wearing RDA patches on their gi. Personally I dislike wearing patches, but watching this fight helps to explain why they're useful on a competition gi for identification purposes. The remaining two minutes is spent on Donald Bowerman, who is introduced as the Brown Belt Division Champion. Unlike Higinbotham, he has a great big RDA patch on the back of his gi. Bowerman is shown in two fights, something that may indicate he only had to fight twice to win the division (if so, that could mean Higinbotham only had to fight once) or that these were the fights selected as most interesting for the DVD. The second disc of Black Belt Requirements closes with another video already released on YouTube, White to Black - Kimura (05:59 mins), appropriately monochrome. This video builds on the first disc in that it is another sequence of moves based around a certain group of techniques, but demonstrated with even greater speed and efficiency than before. Dean narrates the application of a kimura in voiceover, with a musical backing track. He explains the two grips, then notes that you have to be ready for them to try and pull their arm free, switching into a sit-up sweep. The classic lockflow from side control is demonstrated next, then a few counters to the kimura which lead into submissions of your own. Dean also includes lots of smooth transitions, noting that "the darker your belt colour becomes the better you get at setting people up." Lots of other submission opportunities pop up, with a particularly useful sequence of techniques when they try and grab their belt to stop the kimura. You can wristlock that arm or indeed their other arm, with some attacks that require you to break their grip and others that don't. Rather than Roy Dean, it is another black belt taking centre stage on the third disc of Black Belt Requirements: Dave Camarillo. He is well known as an ex-Ralph Gracie student with superlative judo, making him a fitting candidate for the subject of this disc, a seminar entitled Judo Made Easy (45:45 mins). Camarillo breaks down what is going to be covered in the seminar, noting the importance of timing, which is much harder when standing due to the increased mobility. He spends a minute demonstrating ukemi, showing how the typical breakfalling at the start of a BJJ class is not done the same as judo. To properly break a fall, your leg is outstretched rather than curled inwards. The reason you often curl your leg in the context of a jiu jitsu warm-up is because that makes it easier to get up and breakfall again, but it is less effective at dispersing your impact on the ground. That's followed by another minute of breakfalling, this time sideways, enabling Camarillo to fit in a footsweep motion as well. Rounding off the 'warm-up' type section, Camarillo quickly runs through standing up in base (twenty seconds), then progresses to gripping. He talks for a little under two minutes about the importance of posture and intercepting the grip, then a further minute and a half of grip fighting. Getting more specific, Camarillo explains the inside grip, also providing a simple drill where you're both looking for that inside grip (two minutes and forty seconds). Benefitting from the aforementioned increased mobility when you're on your feet, he next shows how to move your partner around from the grip fight for two minutes. That combines with his next drill, this time for practicing the foot sweep. The power is in the small toe scraping the mat, according to Camarillo: the camera zooms in to his feet to make this point clear. Two and bit minutes later, he can move into the application, for which it becomes a two person drill for another minute, then a further thirty seconds of the same thing but with both performing the foot sweep motion. Getting on to the actual technique, he spends five minutes running through the throw. Camarillo notes that if you miss with this takedown, it is relatively easy to just put your foot back down and try something else. He also emphasises being on the balls of your feet, stepping in and turning them around. Camarillo spends another four minutes demonstrating a similar throw, sasai tsurikomi ashi. It looks much like the trip from earlier, but now they are being spun over their shin rather than their foot. Camarillo's judo is very quick, so the slow-motion repetition is a welcome inclusion. He also uses a few different grips, noting that this can be done nogi as well, or even in MMA. The next throw is harai goshi, described by Camarillo as one of his personal favourites. He prefers it to seoi-nage, as he finds a lot of people end up falling backwards when they turn in for the throw, because it is too easy to counter. Camarillo therefore proposes harai-goshi instead, as well as using a teaching method contrary to most I've seen. Rather than breaking down how to step in and turn, Camarillo has his partner walk behind him first. That puts them in position for the throw. It seems somewhat counter-intuitive, but makes sense when he later combines it with several other throws. Three and a half minutes later, Camarillo then combines sasai (he shortens it, so I'll do the same) with a forward throw. By 'forward throw', he means a group of takedowns that includes harai-goshi, as well as seoi-nage among various others. If you attempt the sasai and they step over your leg, that puts them right into place for the harai goshi. Just like the drill, they have effectively walked behind you. The next eight minutes or so are spent on getting them to stumble, bringing in footsweeps as well. The footsweep is inside, which can therefore be followed up by a throw which is outside. That progresses to another six minutes of transitioning from the throw into an armbar, keeping your far hand on their far collar to push down on their shoulder, while your near hand pulls up on their near arm. Grab the seam near their armpit and press in with your hand, to take out any slack. They should now find it tough to shrimp away. For the last three minutes, some Roy Dean music fills the speakers as you're treated to Camarillo playing with Dean's students in drilling and randori. His throws all look effortless: if you want to inspire yourself to train more judo, this could be a good motivator (unless you've already been completely put off judo by injuries, like me: I'm beyond help at this point ;D). The finishing touch to the DVD is Camarillo Sandan, four minutes of Camarillo throwing people around, presumably for a judo grading. First it's done slow motion (manually, rather than slowed down through editing), before going full speed. What I liked best was not the throws, however: it was the 'TRAIN WITH EVERYONE!' message in big letters at the start, an excellent slogan given the politics that often plague BJJ.